NG1 Pompeii. Porta Nola Tombs. 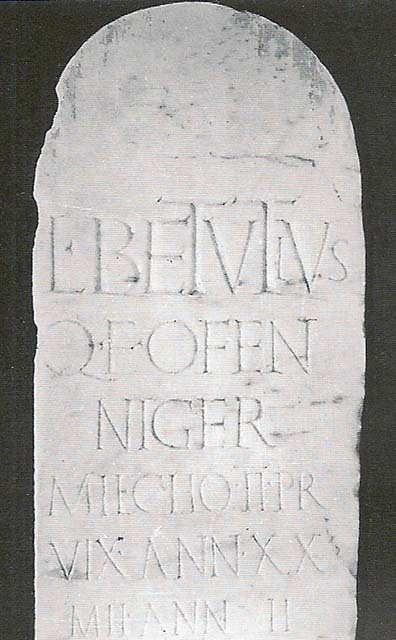 Tomb of Lucius Betutius Niger, son of Quintus. De Caro, 1979, Cronache Pompeiana V, pp. 86-93, pp. 179-187. Dobbins, J. J. and Foss, P. W., 2008. The World of Pompeii. Oxford: Routledge. Cooley, A. and M.G.L., 2004. Pompeii : A Sourcebook. London : Routledge. G66-9, p.156. Soprintendenza Archeologica di Pompei, 1998. Pompei Oltre la Vita: Nuove testimonianze dalle necropoli. Exhibition catalogue, pp. 39-42. Their monuments are stone markers with rounded tops, a type of funerary monument similar to ones found elsewhere in Italy, but they are the only ones of their type so far discovered at Pompeii. By contrast, the burial of a praetorian from Pompeii is marked by a herm, the funerary monument typical of the region. It is also located away from the other praetorians, outside the Stabian Gate. See Cooley, A. and M.G.L., 2004. Pompeii : A Sourcebook. London : Routledge. G66–68, G69, H59, H79, p. 156. Tomb NG1 Pompeii. Tomb of praetorian Lucius Betutius Niger, son of Quintus. The inscription was on a marble slab with a rounded top, fixed in the ground, where a terracotta lidded jar containing the remains of the cremation was buried. Next to this were the remains of the funeral pyre, including fragments of decorative bone, perhaps from a funerary couch. Lucius Betutius Niger, son of Quintus, of the Oufentinan tribe, soldier in the 2nd praetorian cohort. Lived for 20 years, performed military service for 2 years. See Cooley, A. and M.G.L., 2004. Pompeii : A Sourcebook. London : Routledge. G66, p. 156. See Stefani G., in SAP, 1998. Pompei Oltre la Vita: Nuove testimonianze dalle necropoli, p. 40.